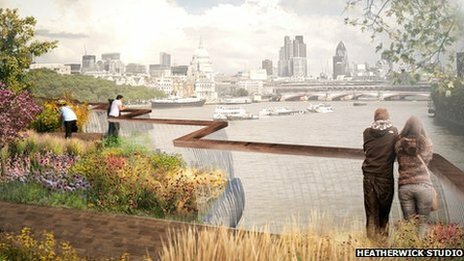 What’s not to like about the proposed Garden Bridge across the Thames? It’s designed by Thomas Heatherwick, a walk-on-water design superstar who came up with the Olympic Cauldron as well as the new Routemaster bus. It would, we are told, “provide a vital new route between north and south London and feature plants, trees, woodland and meandering walkways to be used and enjoyed by all”. The bridge’s “ground breaking design will integrate a new kind of public space into the fabric of the city, adding to London’s rich and diverse horticultural heritage,” its prospectus adds. Oh, and it’s the brainchild of Joanna Lumley. And it’s backed by Boris Johnson. And now that it’s been approved by councillors in Lambeth on the south bank of the Thames, with approval from the City of Westminster to the north expected next month, what started as a celebrity pipedream looks increasingly likely to be built by 2018. But objections have been growing ever since details of the planning application first emerged in October. Grumbles from Labour and Lib Dem London Assembly members, who object to the bridge’s poor cost-benefit ratio, will be dismissed by some as just the usual political knockabout in City Hall (anything Boris backs must, of course, be automatically bad). Some of the objections from people in million-pound flats with riverside views angry about crowds of tourists enjoying the, er, riverside views, are NIMBYish in the extreme (the Taxpayer’s Alliance has also climbed on board – with friends like that who needs enemies?). But objections are also voiced by the Waterloo Community Development Group (a land trust that has been building affordable homes in the area since 1972 – no rich NIMBYs there). There are plenty of objectors who have no political axes to grind, and plenty of reasons why this is one of the tackiest ideas to be proposed in London since Carling and Coca- Cola won sponsorship rights over busking pitches on the Tube. The critics are right. Firstly, the bridge’s cost keeps escalating. Originally estimated as £60m, the bill will be £150m according to the Evening Standard last Friday; according to Construction News this week it is £175m. Despite the initial promises that no public money would go on the project (it was all supposed to be funded through private sponsorship) the government has stumped up £30m and TFL has pledged a further £30 million, later bumped up to £38m. The government says its £30m will only be forthcoming if a business case proved the bridge offers value for money. But “value for money” is always judged so elastically by politicians that I suspect any Tory-led government will back a bridge backed by Boris, and Tory-controlled Westminster, come what may. The Garden Bridge Trust’s chairman, Labour peer Mervyn Davies, is a former chairman of Standard Chartered Bank who’s helped get £3m from Citi Group towards the bridge and who will probably get more sponsorship from big business. Good luck to him: but if banks are giving away money I can think of a thousand and one better causes than this. For east Londoners like me, where downriver of Blackwall the only river crossings are the Stygian Woolwich ferry, a dingy foot tunnel or a single DLR line, there’s something insufferably self-indulgent about the Property firm Farebrother claiming that the Garden Bridge would unite “Midtown and South Bank, forming London’s creative and technological spine”. So why are TFL – who here in Greenwich take a year and counting to repair dangerous motorway bridges, decades to put up fences to protect neighbours from motorway noise, and can’t find the money to extend the DLR to Thamesmead – bending over backwards to provide money and support to a bridge that’s not needed? Labour Assembly Members are right to say that the bridge is a “vanity project” for Boris Johnson, right to criticise it as a waste of money when Thames crossings are so much more badly needed in east London, and right to ask why the public purse will end up subsiding a tourist attraction masquerading as a vital bit of transport infrastructure. Well done to two Lambeth Labour councillors who voted against the plans, Malcolm Clark and Sally Prentice, who observed it was not difficult to cross the river here, and that the estimated 3 million visitors a year would make the South Bank a less enjoyable place to be. Politicians who see through the spin about “iconic” projects like this are too rare. Too many have fallen for an undoubtedly talented designer who just can’t overcome the folly of his brief: the Thames through central London is, quite obviously, an urban environment of water and stone, not a garden centre. As the Observer’s Rowan Moore rightly said earlier this autumn, the proposed garden bridge is “barking up the wrong tree”, and unbearably twee. Lumley’s self-serving voiceover on the bridge’s promotional video says “London offers the best quality of life in the world… London is a city that is always getting better, always offering us more” and that the new bridge would be “like a tiara on the head of our fabulous city”. 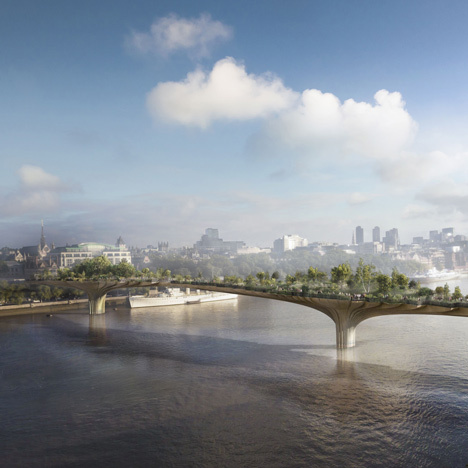 The bridge’s backers say it would “add to London’s rich and diverse horticultural heritage” and that the loss of views from Waterloo Bridge and the Victoria Embankment would be outweighed by the greenery blocking them. “While it is acknowledged that the proposed bridge would shorten views up and down the river when viewed from certain locations, the design is considered to be of such a high quality that it would be viewed as a positive contribution within the landscape,” its ‘visual assessment’ says. Such circular, subjective reasoning could be used to justify pretty much anything. In fact, the bridge would harm the heritage of this part of the river rather than enhance it. Temple Tube station – a Portland stone pavilion built in 1914-15 by Harry W Ford, a prolific Underground architect – would be monstrously overshadowed by huge ramps, pictured here (because of shipping on the river, the bridge has to be a minimum 12.6m above Mean High Water level). Given that the bridge’s trees would be “up to 15m” high on top of that, it sounds more like an obstruction than a new vista. And rather than make this part of London greener and more accessible, in the short term the bridge would deforest and paralyse it: as Londonist – one of the few media outlets not to have fallen for the spin – reminds us, building the bridge would involve the felling of no fewer than 27 mature trees on the south bank and the “temporary closure” of Temple tube station for six months (not very temporary if you ask me). A garden bridge is thus an insult to the history of London. 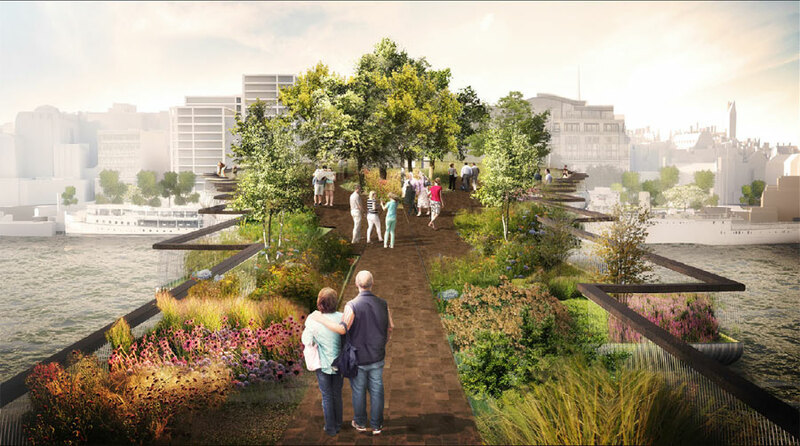 “We’re building a superb Bosky garden bridge in London” said Boris at the Conservative party conference in September. London’s mayor had previously raved about “a bridge with no purpose other than to recreate the soul – with bosky nooks and bowery corners such as Kubla Khan might have called into being in Xanadu”. As a historian who has written half-decent books about ancient Rome, and now Churchill, Boris Johnson should know better. I had to look for a dictionary definition for the word “Bosky” (it means “having an abundance of bushes, shrubs, or trees” and is derived from the Medieval Latin bosca), and it got me thinking about how until Bazalgette’s embankment gardens were created in the 1860s, there would have hardly been a blade of grass – let alone a tree – to be seen along the river Thames in central London. 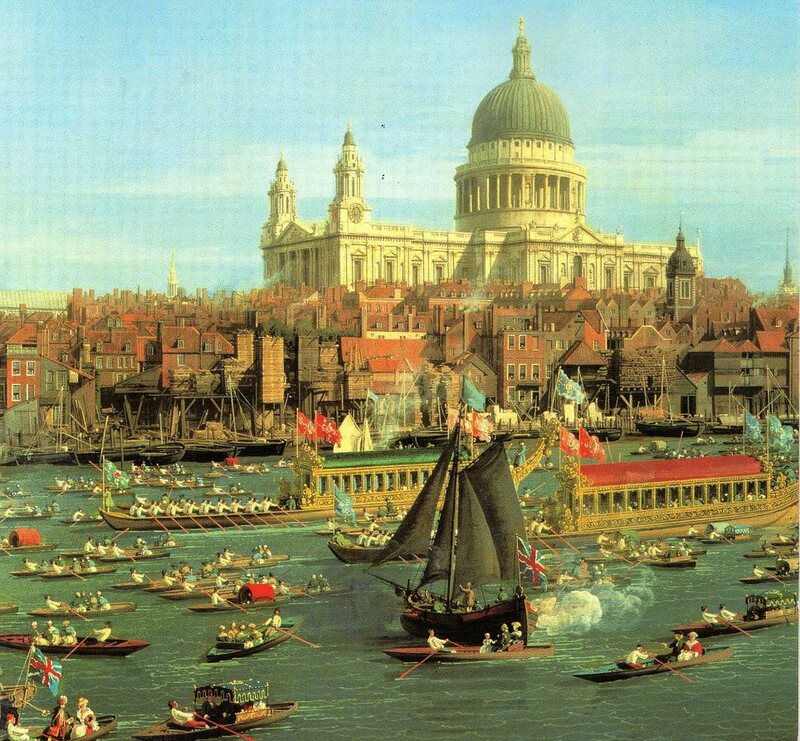 If you look at the great views of London painted by Canaletto in the 1740s there’s hardly any greenery in sight. Trying to “recreate” greenery around the Thames is nonsense: before the river’s embankments were built in the eighteenth century the north bank was an industrial jumble of working wharves and the south bank was not woodland, but a marshy area of islands. It’s easy to forget how recent the Thames’ tree-lined embankments are: David Roberts’ 1861 painting The Houses of Parliament from Millbank reminds us that the Palace of Westminster was built before the Victoria Embankment, not after – right up until the 1860s the Palace dramatically jutted out into the river. And its backers forget that in London it’s the view from the bridge that matters, not the bridge itself. The newest bridges over the Thames – Lifschutz Davidson Sandilands‘s Golden Jubilee footbridges of 2002 and Norman Foster’s Millennium Bridge of 2000 – succeed not because of their architecture or the latter’s (long-corrected) wobble, but because they go somewhere useful. The Jubilee Footbridges offer elegant routes from Charing Cross to Waterloo; the Millennium Bridge is perfectly aligned with the southern entrance of St Paul’s and links it to Tate Modern. By contrast the Garden Bridge would go from nowhere in particular (the Temple, a ghetto of lawyers) to nowhere in particular (two boring office blocks just east of the South Bank Arts Centre, occupied by IBM and ITV London). As the Museum of London Docklands’ recent Bridge exhibition explained, London has always had a very functional attitude to bridges, almost all of which have been rebuilt many times. The “new” London Bridge, rebuilt in 1832 slightly upstream (west) of the old one, was dismantled and sold to the Americans in the late 1960s for no clear reason at all, apart from the Corporation of London needing the money. The current London Bridge, completed in 1973, may have heated pavements to deter frost but otherwise it is a functional nonentity. Waterloo Bridge, built by John Rennie in 1811-17 and “a work of great strength and directness” according to Pevsner, was judged to be “unsafe” in 1924 after the subsidence of two piers and controversially demolished in 1934: its replacement by Sir Giles Gilbert Scott is impressive, but it is astonishing that such a fine Georgian bridge could not have been repaired (a few years ago my brother found an urn in his garden bearing a plaque claiming it was part of the original Waterloo Bridge, like a fragment of the True Cross). Aside from Sir Horace Jones’s Disney-like Tower Bridge of 1894 (itself not great architecture) and the Albert Bridge of 1871-3, central London’s 20 bridges are all functional crossings, not architectural statements. Only four are more than 150 years old: Westminster (1854-62), Charing Cross Railway bridge (1860-64), Battersea Railway bridge (1861-63) and Blackfrairs (1860-69).Only another five predate the twentieth century: RM Ordish’s Albert Bridge of 1871-3, Bazalgette’s bridges at Putney (1882-86), Hammersmith (1883-87) and Battersea (1886-96), and Cubitt’s Blackfriars railway bridge of 1884-86. All the other eleven (Vauxhall, Kew, Southwark, Lambeth, Chiswick, Chelsea, Wandsworth, Waterloo, Grosvenor railway and London bridges) are twentieth century structures (as is Cannon Street railway bridge, although its 1981 concrete reinforcements cover the remains of a Victorian structure). To find older bridges we have to head far west, to Barnes Railway bridge (part of which dates back to 1846-49) and Richmond’s beautiful Portland Stone bridge of 1774-77 – though even this was widened in the 1930s. The current proposal is a reheating of Lumley’s speculative proposal of 1998 for a garden bridge to commemorate Princess Diana, killed in a car crash the previous year (spookily, the car crash happened in a tunnel between the Cours la Reine and the Cours Albert 1er alongside the Seine, Paris’s equivalent of the Victoria Embankment). Whatever else Diana is remembered for, her memorials have proved to be mawkish disasters : a robius band for paddlers in Kensington Gardens, a kitsch “Flame of Liberty” above the underpass where she died, and a ghastly statue in Harrods. The bridge’s origins as a Diana memorial are no longer mentioned by its backers, but given the lousy quality of Diana Memorials that were built, the fact that the garden bridge was turned down as an official Diana Memorial in the late 1990s should give everyone pause for thought. Joanna Lumley has already showed herself to be a shrewd media performer – in 2009 she almost singlehandedly got the then Labour government to overturn its policy on Ghurkha resettlements – but she’s also someone who does not always think through the consequences of her photo opportunities. Allowing former Ghurkhas and their dependents to settle in the UK has had some welcome consequences (there is a large Nepalese community in Plumstead, where I live, which has by and large integrated well) but also some unwelcome ones: even the British Ghurkha Welfare Society has said it would be far more cost-effective if retired Ghurkhas were paid better pensions and encouraged to stay in Nepal rather than settle in Britain, a country with which few of them have any cultural or linguistic ties. So it may be with the Garden Bridge; a seductive idea that may have expensive, and unwelcome, consequences that can’t be foreseen. There may be napalm lurking in the pot-pourri. With news that London’s New year Eve fireworks will from now on be ticketed to deter dangerous overcrowding, it’s clear that the banks of the Thames need to manage their current throng of visitors before creating another magnet for them. The Garden Bridge could make the south bank even more overcrowded, not less. And it wouldn’t really be a public space at all. The more you read about the proposed bridge the more it sounds like Disneyland: groups of more than eight people would need a permit to cross, and seating will have a bumpy surface to discourage rough sleeping. Cycling won’t be permitted- apparently because of the intervention of Lady Lumley herself. This removes one of the few arguments in favour of a bridge here: the need for a safer cycle route from Waterloo to Covent Garden. Oh, and it would be closed at night. Anyone wanting to see what such a self-conscious piece of new “heritage” feels like should look no further than the Globe, rebuilt in the 1990s a few hundred yards east of the proposed Garden Bridge. No matter how lovingly designed, this half-timbered recreation of a Shakespearean theatre will always feel tacky and inauthentic, with an over-priced restaurant and pushy stewards who order you not to sit down, as seventeenth-century groundlings would have done, in case you block a fire exit. Just a few hundred yards in the other direction lies Waterloo Station. If you haven’t been there for a while go and see the broken paving, the piles of litter, the overdose of street clutter and the contempt with which the pedestrian is treated. The £175m being spent on the Garden Bridge could be much better be spent here. The environs of Waterloo, and its perfectly awful pedestrian connections to the rest of central London, are a national scandal that’s always about to be sorted out (promises to create “a great new public space” in front of Waterloo’s Victory Arch, “making what is now a cluttered and tawdry area more open, more spacious and much greener”. I’ll believe it when I see it. Waterloo should not have had to wait decades for its chronic problems to be sorted out, while money is wasted on a footbridge that even the Mayor admits serves no purpose whatsoever. 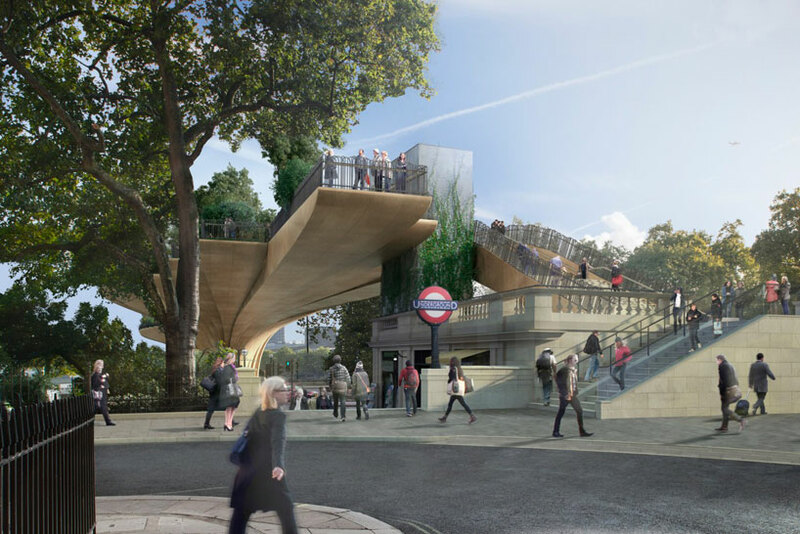 The Guardian’s Dave Hill blogged last week that the Garden Bridge “feels blessed – or cursed – with a quintessential Borisness: spontaneous, ostentatious, very largely useless and likely to be popular just the same.” But Londoners have stopped laughing at “Borisness”, Dave. If TFL hasn’t got the money to fix bridges, put up fences or put a place like Thamesmead on the DLR map it should not waste a penny on this gimmick. London is “Bosky” enough already. This entry was posted in Uncategorized and tagged Architecture, Boris Johnson, Garden Bridge, History, Joanna Lumley, London, Planning, Waterloo. Bookmark the permalink.